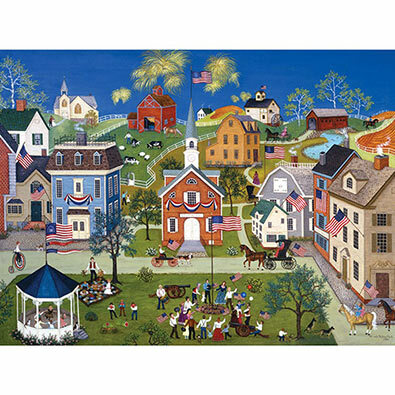 This 300 large piece jigsaw puzzle is designed by Linda Nelson and measures 46 cm x 61 cm. The entire town has gathered around a flagpole in the center of town to celebrate Independence Day. Fireworks explode into colorful bursts in the night sky. Available in two-piece counts. Each 300 large piece jigsaw is designed by Linda Nelson and measures 46cm x 61cm. Available in two piece count. This 300 large piece jigsaw puzzle is designed by Linda Nelson and measures 46cm x 61cm. Available in two piece count. This 300 large piece jigsaw puzzle is designed by Linda Nelson and measures 46 cm x 61 cm. A group poses in front a yellow house station in the middle of the neighborhood. Available in two-piece counts.